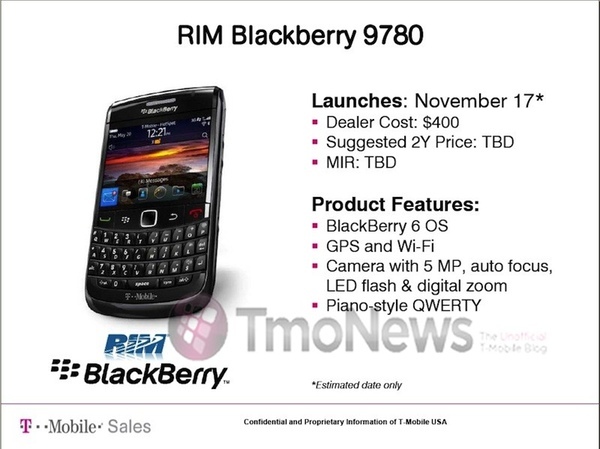 T-Mobile is ramping up for their BlackBerry Bold 9780 launch. While the date is tentative and subject to change the documentation clearly shows November 17th as the expected date. It's stil rather odd that Reseach In Motion has made no mention of the device officially with launch expected across all GSM carriers next month. Kinda makes you wonder if one day you'll just walk into your carrier and the 9700 will no longer exist and the BlackBerry Bold 9780 will just quietly show up. Still now word on the AT&T front for this release but, any T-Mobile fans excited to finally have some form of confirmation the 9780 will be arriving?